Not a single person at Gas Monkey Live stayed still Saturday evening as death/core bands from all over helped us wrap up June with a night of massive pits and a surplus of blast beats. Reeking of marijuana and sweat, even during the openers, this magnificent Dallas venue was packed from start to finish. Melodic “Halocore” act Shadow of Intent (Connecticut) was the first to cater to our ears with subtle, but noticeable blackened elements. This group always proves to be a fan favorite. 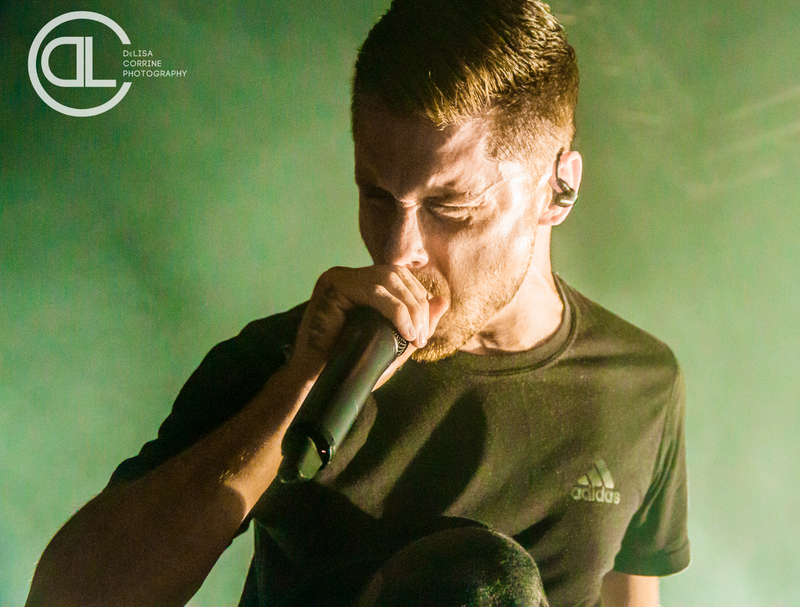 Frontman Ben Duerr’s striking vocal range mixes well with the rest of the band’s melodic assault, bringing you a deathcore band that really stands out against the rest – and that’s not just because the basis of their art is a video game called Halo. What makes them stand out the most? Well, they do nothing, but improve. Exactly what every good band’s goal should be. Though freshly released song “Underneath A Sullen Moon” does feed the angst with a nice one, what gets me about these guys is that they don’t just rely on breakdowns to sound heavy, like too many bands these days. I hadn’t listened to Aversions Crown (Australia), the second act on the lineup, much at all until Saturday. Not very long into their set I was hooked on this space-y deathcore. Not too far on the technical side that pushes some people away, their style is still just intricate enough to reel you in. After frontman Colin Jeffs stepped down, the band welcomed Mark Poida (ex-I, Valiance) to the crew. Poida’s vocals provoke emotions and I feel that just like this band, he deserves much more recognition than he gets. I made a mistake by sleeping on them. Their otherworldly lyrics consist of intimidating extraterrestrial testimonies that compliment their cosmic, atmospheric instrumentals the same way Venus compliments the night sky during summer. The Black Dahlia Murder @ Gas Monkey Live, Dallas, TX. Photo by DeLisa McMurray. Aversions Crown concluded with an older jig and soon, Fleshgod Apocalypse was to take the stage. In 2013, I hung around for this ensemble at a much smaller venue in Fort Worth – what a different atmosphere, and an equally differing lineup. This is another group that doesn’t get anywhere near the amount of appreciation or attention they deserve. Three things that make FA its own are the Opera and Baroque-esque tendencies, the way their guitars bend and melt into soprano vocalist Veronica Bordacchini’s chilling voice, and drummer David Folchitto’s unbelievable endurance. Pianist Francesco Ferrini orchestrates simple yet consistent, eerie yet elegant riffs and proves that sometimes less is more. Armed with captivating theatrics and serene interludes, Fleshgod Apocalypse is a bundle of true artists. Ready for The Black Dahlia Murder and Whitechapel, the crowd that hung outside (why they stayed outside, I’ll never understand) during Fleshgod Apocalypse’s set made a beeline for the doorway leading inside. It was time for The Black Dahlia Murder (Michigan). What a pit! When watching live or comparing the new Nightbringers to the last album Abysmal, you can easily see how lead guitarist Brandon Ellis brings that same kind of energy to the table. TBDM’s enthusiasm and appreciation for their fans is heartwarming. The obsession returned from their fans is notable and completely understood. Everyone was content with their lengthy set and their conquering of the entire newest release Nightbringers in all its glory. It doesn’t get much better. Whitechapel @ Gas Monkey Live, Dallas, TX. Photo by DeLisa McMurray. It can get a little bit better, though! What we were all anticipating was to happen soon. Whitechapel would take the stage at 10:15 pm to play This is Exile in its entirety. One of the best in this genre, and tonight the ringleader of colossal mosh pits, vocalist Phil Bozeman’s style is never mistaken. The “one of” may even be an understatement. Eventually distancing himself from lyrics that didn’t mean much to him and even incorporating clean vocals into some newer releases, it’s safe to assume Bozeman takes an open-minded approach to creating his music. While fresher releases include some unexpected mellow tunes, This is Exile is full of those classic deathcore riffs. Halfway through their set, some folks trickled out early, but the energy and excitement never let up. Though I didn’t get to hear all my favorites that aren’t on This is Exile, Whitechapel was by far the most enjoyable set of the night for me (and the crowd-surfers, I’m sure). I’m already ready to see this whole lineup again! If you were there and you weren’t fired up, I suggest you see a doctor. Aversions Crown @ Gas Monkey Live, Dallas, TX. Photo by DeLisa McMurray. Fleshgod Apocalypse @ Gas Monkey Live, Dallas, TX. Photo by DeLisa McMurray. Shadow of Intent @ Gas Monkey Live, Dallas, TX. Photo by DeLisa McMurray.